Everyone has their staples for Halloween watching, like John Carpenter’s “Halloween” and “Nightmare Before Christmas.” But be forewarned, gentle reader, because your master of Scarimonies (God, I sound like the Crypt Keeper), Dukey Flyswatter, will suggest some gems and themes that may have flown drastically under your radar, like a schizophrenic Vampire Bat. Week five we focus on the fun stuff. Directors: Adam Green, Joe Lynch, Bear McCreary, Adam Rifkin, Tim Sullivan. Stars: Adam Rifkin, Sarah Mutch, Ray Wise. Inspired by Drive-in Grindhouse movies of the 70s and the 80s, the wrap-around story is a raunchy collection of “so bad they’re good” mini movies. The movie is directed by several maestros who are no strangers to the alternative horror universe. In story one, director Joe Lynch (“Holliston”) gets things going as the owner of the last drive-in movie in America, who is not privy to the fact that hordes of zombies during the film “Zom-B-Movie” are snacking on the teenagers. We cut back and forth to this scenario as the other rare (fake) flickers start and finish. The first official story movie-wise is the mutha of all monster movies, and it’s called “Wadzilla.” If you guessed a crass and messy creature feature in the Godzilla vein you would be right, except the giant reptilian radioactive peril is replaced by a very angry and skyscraper-sized sperm. Adam Rifkin (“Reality Show”) keeps things poppin’ (sorry) and suitably cheap to keep the audience knee-slapping. After a brief return to the Zom-B-movie, Tim Sullivan (“2001 Maniacs”) directs a kind of odd horror musical that spoofs the Beach Party movies and Hollywood homo attitudes to helm “I Was A Teenage Were-Bear.” It’s been surmised that this is the most awkward of the tales, and maybe is a bit stereotypical of gays in movies, but on the other hand, a great deal of folks on this part of the production were gay, so your guess is as good as mine. It’s just not as funny as the rest. Adam Green (“Hatchet”) delivers the blue ribbon of the piece, with “Diary Of Anne Frankenstein.” It’s slightly offensive. The Monster (Kane Hodder, Jason of the “Friday The 13th” film series) is revived wearing a Yarmulke and Payot. Hitler is singing and dancing to some of the funniest fake German you’ll ever hear, and the subtitles are doing double time as well. Bear McCreary (66 episodes of “Agents Of Shield”) is listed here on IMDb as directing parts of “Zom-B-Movie” and the fake trailer “I Don’t Want To Die A Virgin,” but is not listed on other sites. I’m not taking a stand on it, so feel free to correct me. 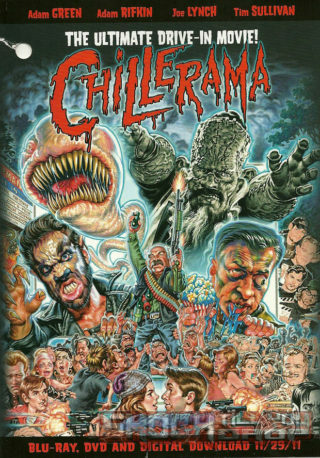 “Chillerama” is not going to appeal to everyone. Its rowdy and rambunctious nature might be too much for some viewers. But like other horror comedies with a fast pace and short vignettes, if you don’t like one joke or it’s overtly childish, you don’t have long to wait for the next one. This film has more than enough gags to make you laugh or gag and that works for me.